Image Size: 23 x 33 in. 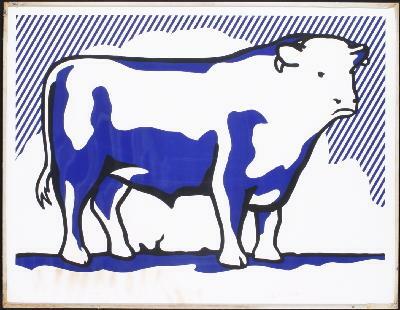 Beautiful Lichtenstein Bull II SIGNED Lithograph. This is a wonderful exciting Offset Lithograph, Lithograph and line-cut on Arjomari paper from the Bull Profile series. Numbered in pencil, lower left, Signed and dated in pencil, lower right. Blind stamp, lower right. Workshop number on version in pencil, lower left, beneath stamp. Publisher and Printer: Gemini G.E.L., Los Angeles. Fully catalogued and referenced in Corlett #117, page 128. Regarding the condition: Some light brown staining in the lower left. The staining is not from water damage, as the paper is not wavy. The print has been examined thoroughly by a reputable, Lichtenstein Estate approved Restorer, and the cause of the staining is unknown. Limited Edition features sophisticated brilliant color tones in this print, excellent! “It is the RARE hard to find SIGNED Limited Edition”. This item selling in Upscale Art Galleries and Museum galleries when and if it can be found. This item is subject to availability. This is perfect for any elegant home, office, restaurant or place of business. Click the button below to add the Beautiful Lichtenstein Bull II SIGNED to your wish list.